Well, hello ingredients list. Is it summer again? No, sadly, it is still December and will be winter for quite some time. 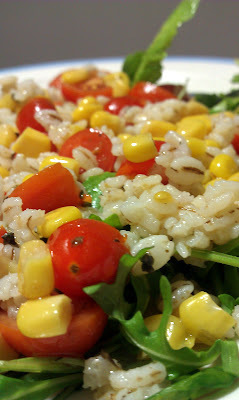 But when I discovered organic arugula at the grocery store this week, I couldn’t resist whipping up a simple, weeknight dinner with a light, lemon flavor. Arugula is one of my favorite leafy greens. Much lighter and less bitter than others, I’m happy to eat these little guys leaves and all. It holds up well to citrus acid and black pepper, some of my favorite seasoning, and it’s very versatile. When I found a recipe that used it with barley, an under-used grain on my part, and some of my favorite vegetables, I was eager to try it. The recipe I used is an oldy from the New York Time, fast and easy, and without almost any strange ingredients (unless you don’t usually keep these veggies on hand). 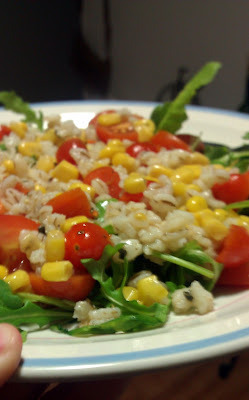 While the original calls for pearl barley and suggests soaking, I had quick-cook hulled barley, so my version took only about 20 minutes total. You can buy barley in several different forms, which are differentiated based on how much of the hull or shell of the barley has been removed. Hulled barley is the whole grain form, and is most nutritious, but takes the longest (an hour or more) to cook . Pearl barley is what people refer to if they just say “barley,” and has had the outer husk and bran layers removed. This form takes about 40 minutes to cook (though less if, as the recipe above suggests, you soak it). I’ve got Quaker quick-cook barley, because that’s what they sell at my grocery store, this form as been par-cooked and retains the least nutritional value, but is still about equal in nutrients to a whole wheat pasta, so I’ll take it. At any rate, all this recipe requires cooking is the barley. 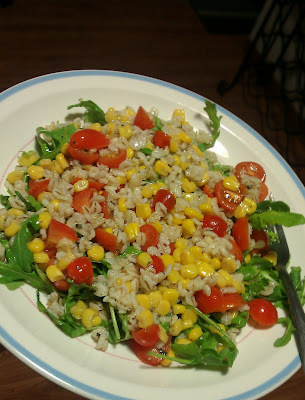 The rest is as simple as washing arugula, chopping tomatoes and whisking a simply dressing. The result is a delicious and filling entree salad that will allow you to master barley as an ingredient without having to juggle other cooking tasks at the same time, all while bringing a hint of summer into our December kitchens.